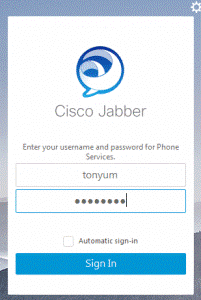 ICTO provides staff with Jabber application. Jabber is a unified communication solution, which lets you access all unified communication Services anywhere with any device. To have easy access voice call, point-to-point video call, voice mail, file sharing, desktop sharing and audio conferencing capabilities with your PC or mobile device. For working purpose, to call back Macao worldwide without making long distance call. E.g. you can make a call to your colleagues or receive a call with your extension when working outside Macao. To find and call colleagues’ extension easily. To make a call by clicking call button on the MS Outlook emails contact. To set up call forwarding with mobile when you are not at your workstation. UM Staff can login the Jabber with the UMPASS. If you want to use Jabber on your personal devices such as mobile device, please enter <UserID>@umac.mo at the first time, then you can login with your UMPASS. Type the contact person’s user ID or extension on the search box. Click the “+” icon next to the contact name. 4. Add the contact to a group, click “New group” to create a new group if necessary. To make a voice call, you may enter extension, user ID or name in the search box, and click the call button to dial. By default, you will receive and answer calls from your IP phone device. 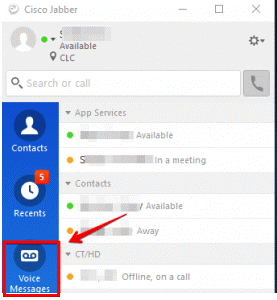 To answer calls with desktop Jabber, please click the icon and select “Use my computer for calls”. 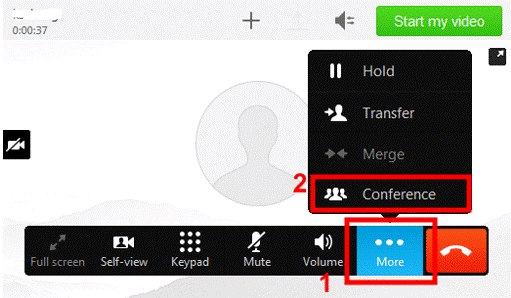 During the call, click “More” button and choose “Conference”. 3. Dial the third phone number to join the conference. 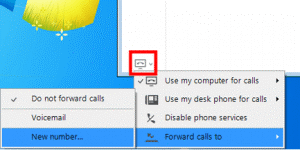 To forward all calls to another number, please click calls icon, and select “Forward calls to”. After that, click “New number…” and input the phone number for call forwarding. To make a call via Outlook, you may click the call button on Outlook’s contact and call the person. To manage your voicemail, please go to “Voice Massages” tab to play, forward or delete voice messages. 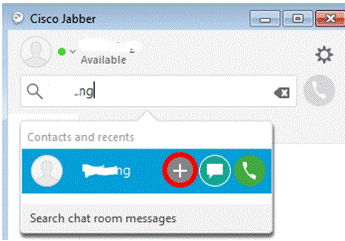 Regarding the features and operations of Jabber, please refer to the following quick reference guide and FAQ.